BSSEC are accredited providers of Display Energy Certificates for your buildings. 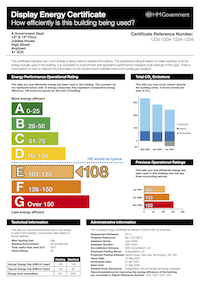 All public buildings in England and Wales require a Display Energy Certificate (DEC) showing actual energy use, and not just the theoretical energy rating. DECs show the actual energy consumption of a building, the Operational Rating, and help the general public to understand the energy efficiency of a building. The DEC rating is based on the energy consumption of the building from all energy sources, including gas, electricity and fuel oil, over a 12 month period. The DEC must be clearly displayed at all times and made visible to the public. DECs are required for buildings with a total useful floor area over 250m² that are occupied by a public authority or institution providing a public service to, and visited by, a large number of persons. Where the building has a total useful floor area of more than 1,000m², the DEC is valid for 12 months. The accompanying advisory report is valid for seven years. Where the building has a total useful floor area of between 250m² and 1000m², the DEC and advisory report are valid for 10 years. BSSEC energy assessors are trained to supply you with both the required Display Energy Certificate and accompanying Advisory Report, which will provide tailored advice to help you cut the energy costs and carbon emissions in your buildings. Contact us now to discuss your requirements.